Maybe this isn’t your first time making food for a bunch of people, just your first time hosting a holiday, or perhaps it’s both. Either way, hosting your first Thanksgiving—for family, friends, or both—can be a daunting task. Here are some tips for a terrific turkey day! 1. Make a note of any and all dietary restrictions. When you’re making food, you want to make sure you’re making food for everyone. Be considerate of all your guests’ food allergies and dietary restrictions. 2. Make sure you have enough food for everyone. Equally as important as dietary restrictions, making sure everyone has enough to eat and drink is a definite priority when it comes to serving guests. While pinpointing how much someone is going to eat can be a bit precarious, the Internet is full of intricately detailed serving size charts helpful to party hosts. Compare and contrast charts to determine the right sizes—odds are they’ll be quite similar. At the end of the day, a host likely knows their guests the best, and can determine how much to make. 3. Play with your food. Creating cute appetizers and desserts are fun—at any age. If there will be children in attendance, they will especially appreciate these snacks. Mini pumpkin pastries and turkey-shaped cupcakes are frankly quite adorable, and almost look like decorations set up on the table. These endearing hors d’oeuvres are a great way to avoid leftovers. Time is precious when you’re cooking for a lot of people. Don’t forget to prepare and start early. Slicing vegetables, cubing bread, and other tasks that can be done the day before should certainly be done then. While they may seem like small tasks, they can add up quickly. Completing smaller tasks allows you to be your own sous chef—you’re helping yourself beforehand. 5. After all, this is Thanksgiving. While numerous commercials urge Black Friday shoppers to start at 6 p.m. on Thursday, remember that Thanksgiving is a time to gather and be gracious. While there is pressure to rush, there is no need to when you are prepared. 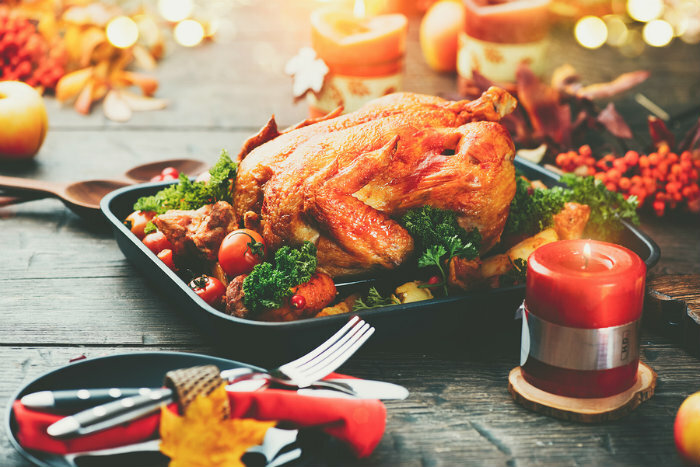 Being surrounded by plenty of family, friends, or a sweet mix of both enjoying the fruits—and vegetables, turkey, and stuffing—of your labor is worth savoring.